When my company recently moved premises, we found a great plot of land. Previously a farm, it had plenty of space for our expanding business, lots of storage and plenty of space for a new purpose built office. The problem was that the BT Broadband connection was a maximum of 1.2MB due to the distance from the Exchange, which was never going to be suitable for 8 users checking email and carrying out their daily activities. We needed an alternative, and the alternative was to use 4G as business internet solution. Like most businesses, our company had grown use to high-speed internet so we needed to find an alternative to the poor-quality speeds provided by the BT infrastructure. Satellite Internet was an expensive and slow option, so we turned to 4G for options. 4G has become much more widely available in the UK recently with speeds and coverage increasing all the time. Unfortunately, the coverage information provided by Ofcom and the mobile phone networks in relation to data coverage is poor and not very accurate which can make it a bit of a lottery when trying to decipher where there is a good 4G signal. To find out I asked a number of staff with mobile phones on different networks to visit the new location. I asked them to download the Speedtest app onto their smartphones and we then checked each networks speed in the area. In my case it was EE and 3 with the strongest signal and faster speeds. It was important for me that I could integrate the 4G internet connection into my companies Local Area Network (LAN) and I wanted the router to be the DHCP server. To do this I decided I would purchase a 4G router and after some research settled on the Asus 4G-N12. Getting the system up-and-running was fairly simple. I ordered a SIM from EE and plugged it into the slot on the side of the router. 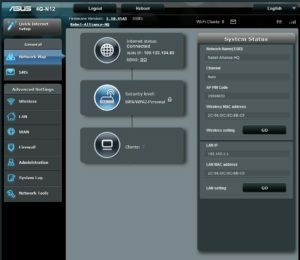 Once the router was on I logged into the Asus control panel by going to the IP address 192.168.1.1 and using the username admin and the password admin. Once I was logged in the router’s admin screen the firmware automatically ran me through the setup process. All I needed was the SIM PIN which was written on the packet (you may need to call your mobile provider for this). In my case it was 1111. Once all connected I was instantly able to connect to the building in wifi option of the router. One of the disadvantages of the router I purchased (and the problem with most in the price range) is that there is no option for adding an additional 4G antenna. I could already get a reasonable signal with the router on my desk but I knew I’d increase it if I could get the device higher up. 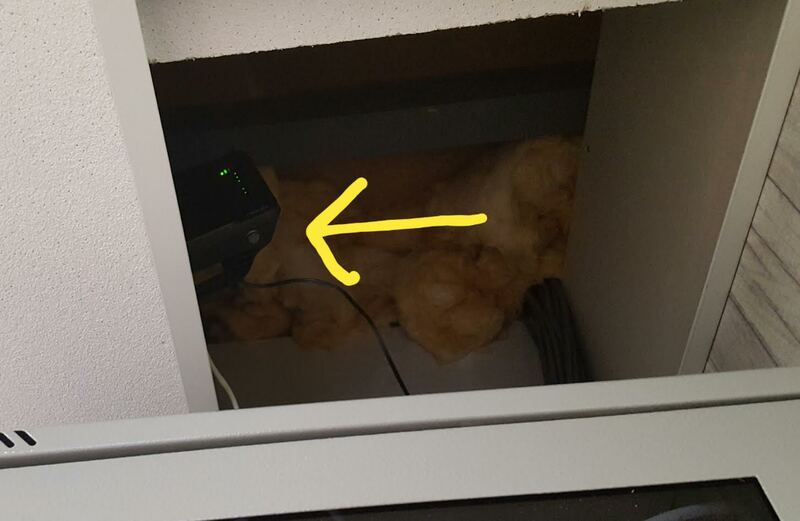 So, I added a longer ethernet cable to the router and placed it on top of the false ceiling in our office. Up there I was able to achieve 25mb speeds very easily which was a considerable improvement on the BT connection. After speaking to our handyman, we decided we could probably improve this even more if we could build a tower and locate this to the roof of the building, thus improving the line-of-sight to the nearest 4G mast. As the router is 12v, we discussed perhaps making a simple 12v solar-powered system for it, but for now it was good enough and we were able to use 4G as business internet solution with no problems whatsoever. Can you see me? We placed the router up high above the false ceiling to improve reception. The problem with using 4G as business internet connection is the cost. Although some networks claim to offer ‘unlimited’ internet connections, my research discovered that none actually do. The networks either cap your usage under a fair usage policy or they throttle your speeds. This means that you are somewhat limited to how much you can use the internet before you begin to occur some expensive additional charges. What I did notice was just how much data was used for even basic Internet usage and the checking of email. I also discovered that Microsoft Windows 10 (which is what all of our computers run) uses a surprising amount of data just checking for updates. Obviously some of these issues needed to be resolved if we were going to truly use 4G as a real alternative to BT fibre. Our first few days weren’t too great when it came to reliability. Suddenly the signal was much lower than I’d experienced during my tests but thankfully it turned out that the blip in speed was caused by a temporary fault with a local cell mast. Since then, the 4G internet as been excellent. Very reliable, very fast, and increasingly cheaper. ← Do I have to pay tax on Google Adsense commission? 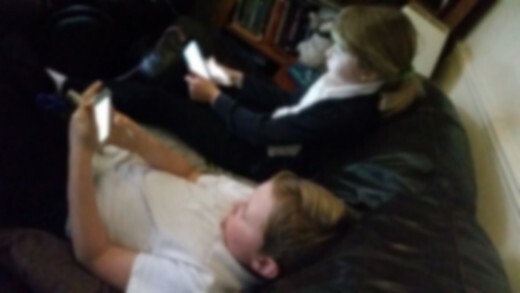 Is your child a Gadget Gremlin?